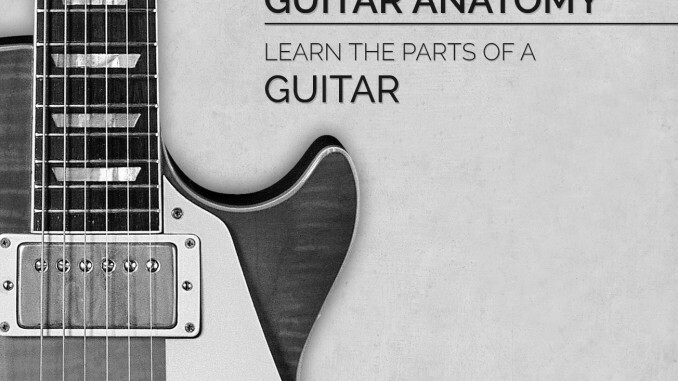 Did you know that there are at least 21 parts of a guitar for a beginner to learn? In this lesson, I’ll show you the parts of an electric guitar and an acoustic guitar. I’ll also show you the standard tuning, how strings are numbered, and how frets are numbered. Generally speaking, there are two types of guitars: acoustic and electric. Luthiers, or guitar makers, build acoustic guitars so they can be played without amplification. Electric guitars require an amplifier to produce a sound loud enough to hear well. Despite their differences, electric and acoustic guitars are played the same way. 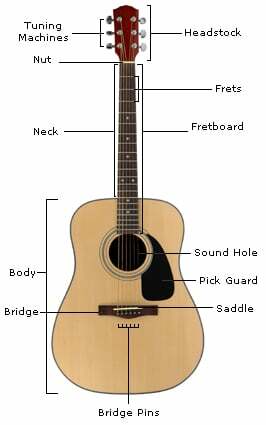 Several guitar parts are common to both acoustics and electrics, others are specific. Strings are numbered from the thinnest string (1st string) to the thickest string (6th string). 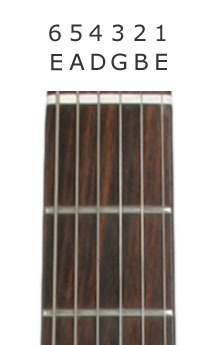 The tuning is given from the 6th string to the 1st string: E-A-D-G-B-E. This tuning (E-A-D-G-B-E) is called standard tuning. Frets are numbered from the headstock toward the body starting with 1. Sometimes the number 0 or letter O is used to denote an open string, or one that is played without fretting a note. Fretting a note is executed by pressing the string down behind a fret (on the headstock side of the fret). 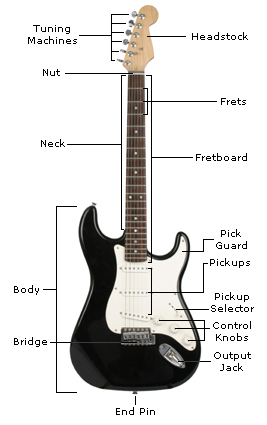 Guitarists can move horizontally up or down the fretboard, or vertically across the fretboard. These are common terms used to communicate how to shift your hands when playing the guitar. Wow, thanks for the interesting and really helpful post. Im trying to learn more about guitar. Cheers! Chris, Thank you for your kind words. 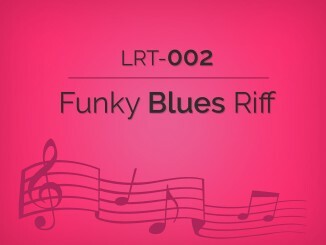 I’m really glad that this lesson helped your student understand the parts of the guitar. Thx for this! 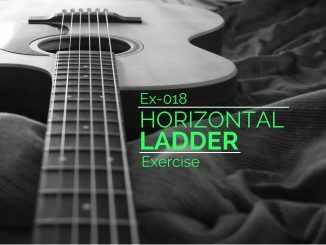 I’m the FRETX founder, and we use parts of this blog to get useful information about guitars to help our users and employees to get a grasp on the instrument. Thank you for posting this info. I love music and have always played horns. I wanted to learn something new and I love the sound of an acoustic. I never learned to play an instrument without learning it’s parts first. I’m not sure how anyone can play an instrument without learning the parts. This has been extremely helpful. I am glad that this article helped you. There are certainly a lot of guitar parts!